It’s love at first sight for me, gorgeous! I do wish I was that butterfly. And yes, I survived my underground adventures! It seems to me that you do a fairly good job of spreading your wings as it is — not to mention keeping your antennae extended. It’s good to see you. I wondered how the great adventure turned out. Now I can breathe a little easier. I do love these flowers. They don’t last long, but while they’re around, they’re gorgeous. The treasures of Texas I never knew existed. Coming here is an education, Linda, Thanks! You’re welcome, GP. We have so much variety, and so much of it is beautiful, or interesting, or both. It makes me happy that I’m introducing you some things you’ve not seen, and that you’re enjoying them. A good plant biography you’ve got here, even to the mountain tavern. I’m with you in finding those tapering blue buds probably more intriguing than the open “stars.” Your mention of the latter, along with the word thousands, made me wonder whether you remember a certain song. The layers of color in the buds remind me of a parfait. I thought it interesting that both species show similar colors and pattern, despite other differences. 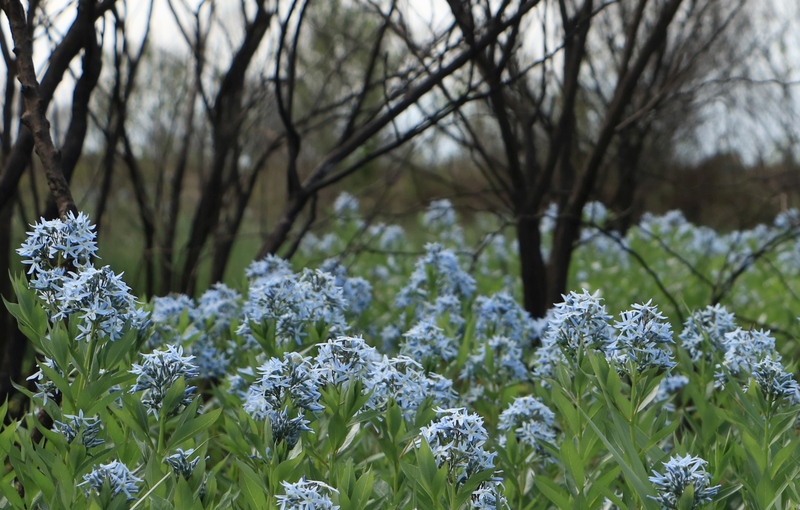 I wish I could have another chance at those flowers in front of the log and the burned portion of the prairie. I think I could get all of the flowers in focus now. Still, even at the time I remembered your photo of the post-fire white prickly poppy at Bastrop, and gave it a go. I do remember that song. In fact, I remember more of the lyrics than I would have imagined. Listening now, I wish the writer could have done something with the double negative in those first lines: “there’ll never be no other love…” I know. Picky, picky. Wow, what a find! I’m jealous! I’ve only seen a few here and there over the years. I tried to grow another species in the garden last year, A. illustris, but it has not returned this year. Not sure what happened to it. You made me laugh. I’m usually the one suffering from floral jealousy. I’ve found A. tabernaemontana in several places; they’re usually near a ditch and in spots with plenty of sunlight. I was interested to read that A. illustris is called Ozark bluestar. The USDA map shows it in four counties in Texas, but it’s not on the BONAP site, which seems strange. 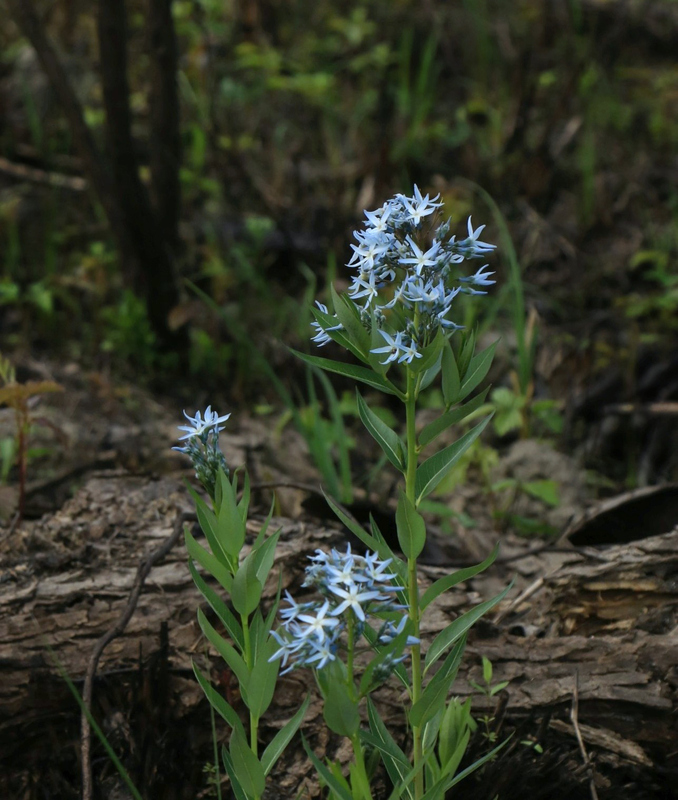 The Missouri Botanical Garden says, “Amsonia illustris, commonly called Ozark bluestar or shining blue star, is a Missouri native perennial that most frequently occurs in sandy or rocky soils on gravel bars or along streams in the Ozark region of the state.” Maybe you should get yours a box of gravel to sink its feet into. That is a great shot of the butterfly. You should see how many butterfly photos I threw away. There were three other species fluttering around, but I just kept one photo of each for reference, since they weren’t at all sharp. I’m glad I had one for you to enjoy! That is the luxury of digital. And it’s a luxury I freely indulge in! I’ve always loved anything blue and this one little plant is so pleasing to me. The photos are marvelous. I can well imagine how thrilling is was to see a sea of blue on the sides of the road. I think it would make me down right giddy. It was such a surprise to see fields filled with these flowers. We expect it with the Indian paintbrush, bluebonnets, and primrose, but this was something I’d never imagined. If you’re a blue lover, I can see how these would appeal to you. Even though it’s a light blue, it’s a clear, pure blue, and just lovely. Thanks, Pit. That second species might do well for you — especially since they’re deer resistant! I think I saw something very similar to this growing at the ditch last year. I’m not sure — I can’t remember if I photographed it or not and it may well not be the same thing but boy, are those ever pretty. I love the vernacular names far more than the genus, though I know they probably have to have those just to keep everything straight in the world. Very pretty indeed. 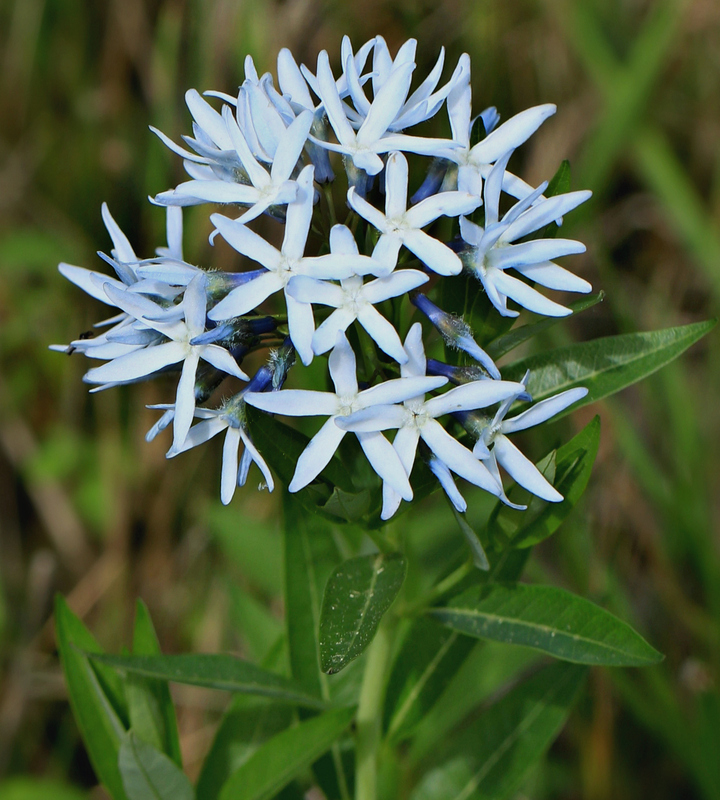 Scientific names are important, especially since so many plants can have the same common name — but I’m with you when it comes to enjoying and being comfortable with names like ‘Blue star.’ They’re descriptive — and fun — in a different way. 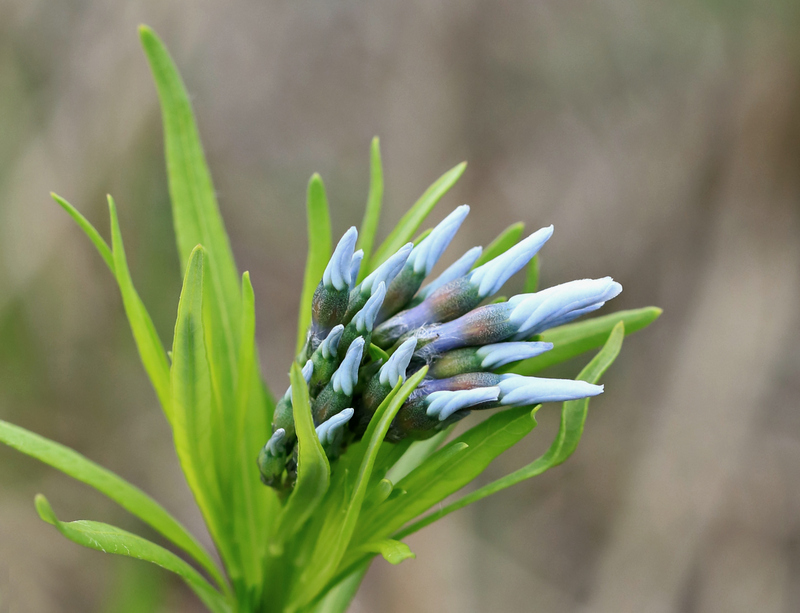 You may very well have seen an amsonia of some sort up there. They aren’t native, but it’s possible that some escaped from a garden. Has the ditch started greening up at all? Or do you even know? I suspect that you’ve been kept closer to home than you’re accustomed to, given recent events. I really appreciated your update on Rick today. I know he’ll be glad to finally be “on the move” again, even if it’s only walking. These make me smile, Linda — both the gorgeous color and the shape of the stars. I’m glad that passerby clued you in on continuing your trip to see the prescribed burn, too. It’s nice to know that even from the ashes, Nature is resilient and persistent! I certainly was glad for the tip. Without it, I might have spent the whole day photographing the first little stand of flowers I found, not realizing what lay farther down the road. And isn’t it wonderful to see so many resurrections: from winter, from fire, from neglect. There are uncounted miracles every day, shining just like these stars. Beautiful shots, Linda–all of them and I couldn’t choose one above the other. I always like to see a pollinator doing its thing, so thanks for those pics. I know this plant–the first one, but don’t think I’ve seen any in recent times. It’s a lovely plant in all its forms, isn’t it? I didn’t realize until I began doing a bit of research about the various species that it can turn wonderfully golden in the fall; the foliage is as pleasing as the flowers. I’ve never seen it, or at least I’m not aware of seeing it, but I’ll be looking for it. Perhaps our native species aren’t so flamboyant, but photos of others are spectacular. I can’t make many guarantees about things I see in nature, but I’d be willing to guarantee that the butterflies I found swarming these plants were happy. There was plenty of nectar for everyone — it was like an open bar at a convention. Your Latinized name reminded me of “Che Gelida Manina” from Puccini’s La Boheme. My grandmother was a great admirer of the Swedish tenor Jussi Björling, and had a recording or two which she felt compelled to inflict on us. I think that aria was part of her collection. I’m more appreciative now than I was at the time. 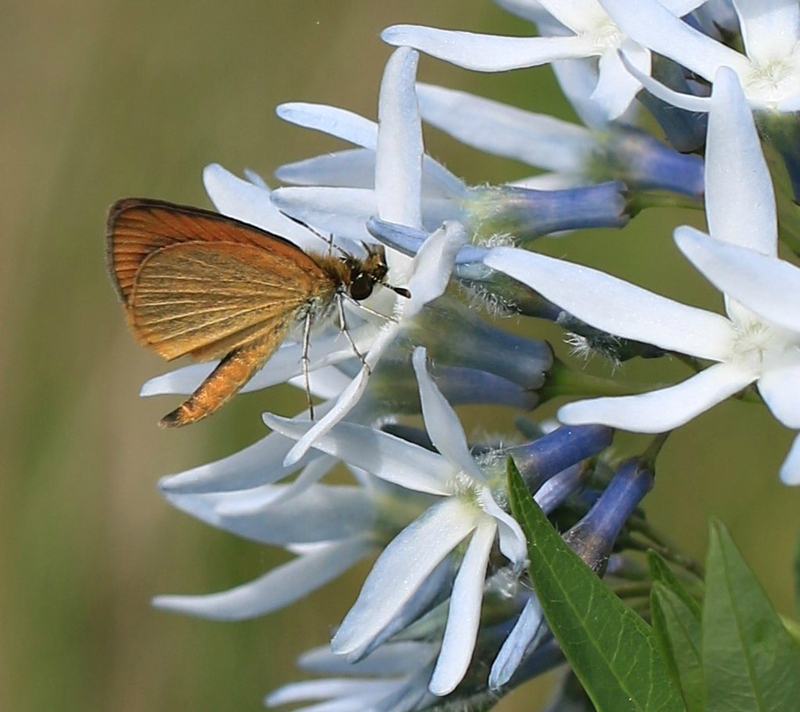 All are lovely Blue Star bloom images and the one with the skipper is very nice. 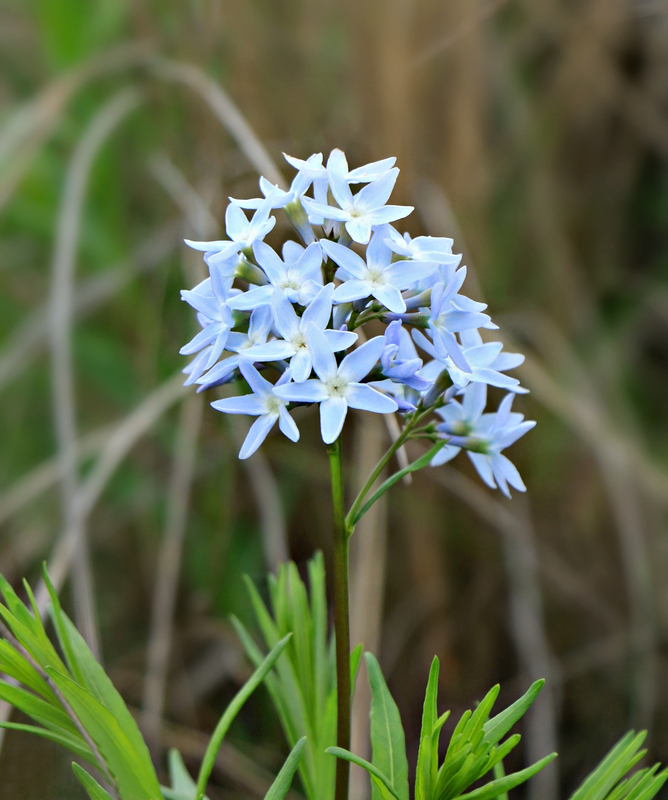 We actually have some Blue Star growing as a perennial in our yard. Happily it returns annually and has grown into a nice clump. I have yet to photograph it but have a project I am considering and that would be a part of it. What a treat, to have this in your yard. Does its foliage turn beautifully golden in the fall? 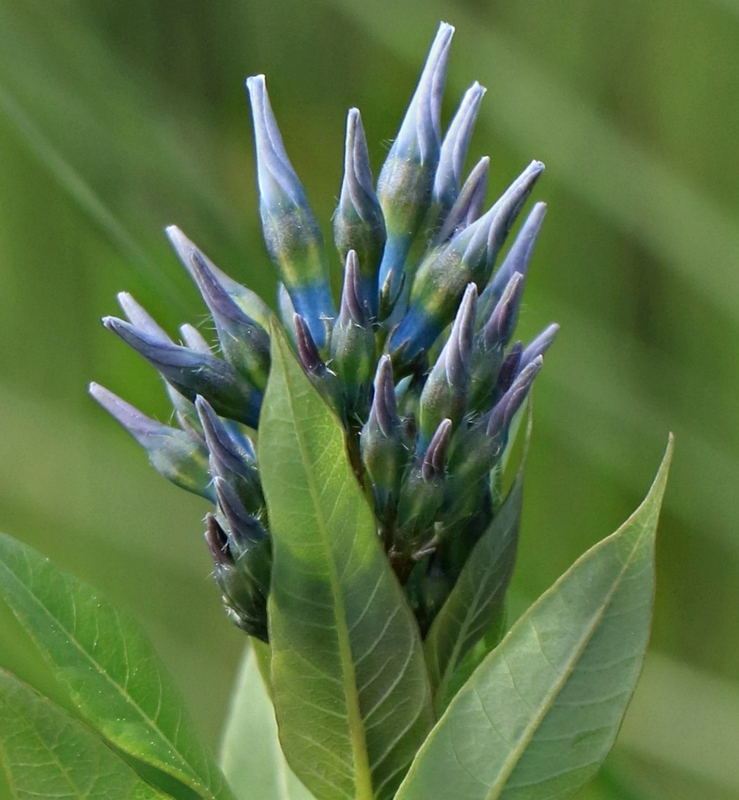 I’ve seen photos of some other Amsonia species that have really remarkable foliage: feathery, and so colorful. I’d grow the plant for the fall color as much as for the spring flowers. Yes, the leaves turn golden in autumn. Not entirely in my yard, but it is involved. I could say similar as Agassiz as I have yet to catalog our year…although it is no way a botanical wonderland. Still, a lot going on out there. The last photo of the butterfly with its wings spread out made me think of an aeroplane landing. If you squint your eyes and think of a Boeing landing you will get what I mean. It is a magnificent butterfly in its grandeur and full flight mode. I don’t even need to squint, Gerard. I saw that butterfly coming in for a landing, too. 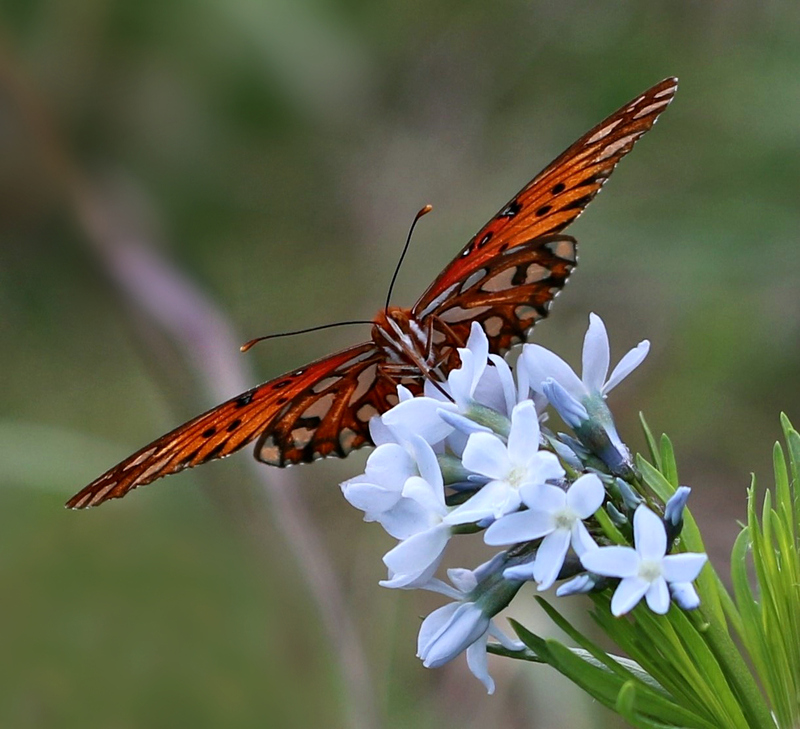 I didn’t realize until recently that fritillaries belong to a group of butterflies known as “long-winged,” and the photo just happens to emphasize those long, relatively narrow wings. I like the way its antennae are spread parallel to its wings, too. I don’t know if there’s a reason for that, but it makes for a great photo. Lone-Star blue stars! That last photo was the star of the show. I love the word “fritillary” — it’s such an un-butterfly-like word. Every time I hear ‘fritillary’ I get tripped up at the first syllable and think we’re going to be discussing ‘frittata.’ Those darned frittatas are linked to my insistent misspelling of ‘fritillary,’ too, since I never can figure out which letter ‘t’ to double. A mix of Texas yellow star, blue stars, and star hibiscus would be a neat variation on the paintbrush/bluebonnet/groundsel theme. I’m not sure they’d ever be found growing together, thanks to preferences for different growing conditions, but it’s still neat to imagine. Absolutely gorgeous and how lucky to see a whole landscape brimming with the colour (after the burn). Reminds me a bit of seeing the sea of bluebells in the woods near the estate I worked on in Sussex, U.K. in 1978. Your mention of the bluebells in England brought all of those wonderful photos to mind. 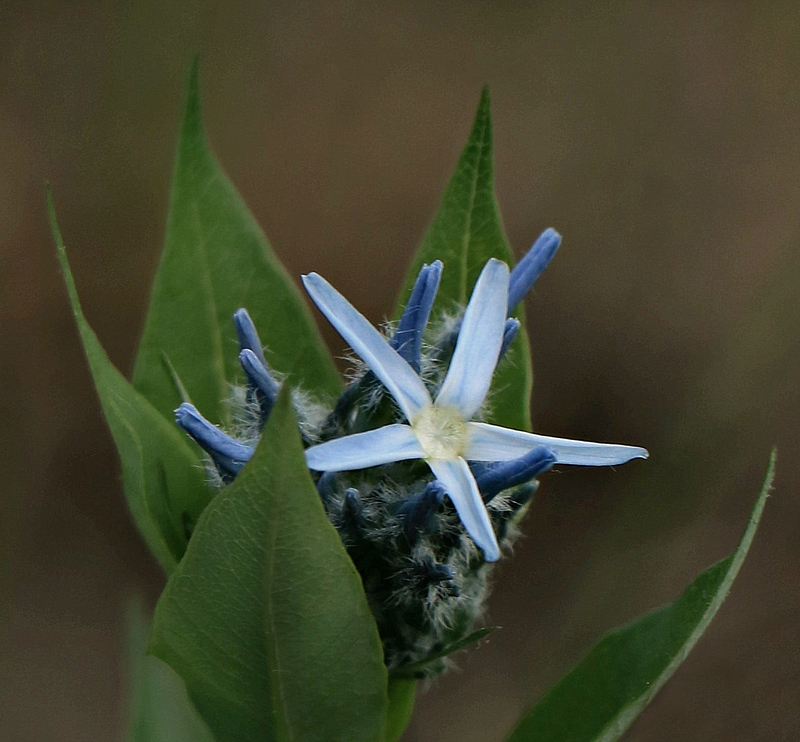 I didn’t think of them at the time, but later it occurred to me that these blue stars were my first experience of seeing flowers and woods in such a way — even though the ‘woods’ weren’t anything close to a forest or the real woods that exist in other parts of our state. I know a painter who often begins by painting his canvas black, and then adding the colors. That’s what happened here, in a sense. First fire turned the landscape black, and then nature added the color. I think the fritillaries are wonderful, and that one posed wonderfully well. I’m so happy to have the butterflies back again. The flowers are delightful to see, but it’s even better to see their fluttery friends making use of their nectar and pollen. Beautiful flowers! I had not heard of them before and find it very interesting that they are members of the dogbane family. They are beautiful. Both their delicate color and that star shaped flower are really nice. You know what I found interesting? I’d never heard of the dogbane family, and had to spend some time learning about that. I was amazed to read that the name came from the practice of using some of the plants to poison dogs. Why anyone would want to do that I’m not sure, but it does explain the name. I do know that bluestars are deer resistant, which suggests that the toxicity is real! I’ve read also that dogbane is toxic to grazing animals and fortunately the milky sap is very bitter and they avoid it. The species that is present here is Apocynum androsaemifolium (Spreading Dogbane). That also has very pretty flowers. When I read that it’s present in Texas, I checked the USDA and BONAP maps and discovered that’s true — sort of. It’s been reported in three counties in the Big Bend area. A. cannabinum, or Indian hemp, is more widespread, but still north and west of my area. Aren’t they pretty? There are several varieties that are used in gardens, and they certainly do attract the butterflies. There were at least three species flitting around that I never could photograph clearly, but the frittilaries seem more inclined to stay put for at least a few seconds. I thought of you when I read this very interesting article about making life easier for London’s hedgehogs. Such simple changes can make such a big difference. I’ve seen photos of fireweed springing up after conflagrations in the west over the past few years. Obviously, it’s been springing up for a good long time — it’s just that I’m becoming more aware of such things. With or without fire, of course, there are surprises every year. Flowers that never have given a neighborhood a passing glance suddenly settle in and call all the relatives to join them, while others pack up and leave town without a word. It’s part of the fun, especially if we can learn to be a little flexible with what constitutes a “good” year. I first became aware of fireweed when I lived in Alaska, Linda. Now I find it in lots of places, like up in the Sierras and Cascades, where I don’t recall seeing it in the past.